For quite some time the Toyota Camry has been the benchmark for conservative sedan shoppers, an unarguably logical vehicle that does just about everything right. It’s a bit like the club sandwich on a hotel room service menu – you usually can’t go wrong. 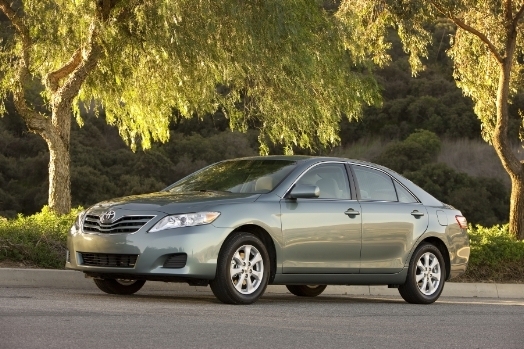 For 2010 the Camry gets a revised front fascia, larger headlamps and revised tail lamps. Automatic up/down power windows are standard on all models and a USB-compatible stereo has been added to the options list for those of you who simply can’t live without your iPod (which seems like everyone these days), not to mention Bluetooth hands-free capability. The base engine has been bumped up to a 2.5-liter inline four-cylinder, replacing the old 2.4-liter, and is available in two forms of tune, with LE and XLE trims producing 169 hp and SE models getting a 10 hp bump to 179. And if that’s not enough, there is a 3.5-liter V-6 available too. As always, the Camry seems to have all the bases covered. Then again, you would be foolish to bet against it. As always, the Camry hits all the right points. Drivability is adequate, the chassis is docile, pricing is right in the sweet spot for the segment and reliability is bulletproof. 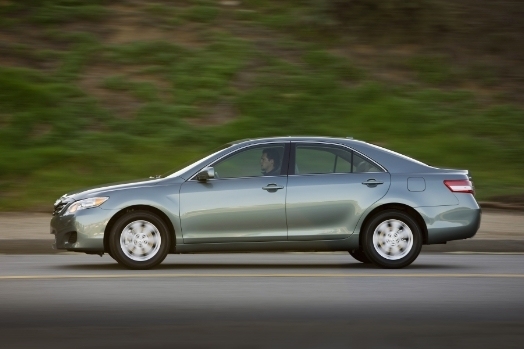 Fuel economy is also a key factor, and at 32 mpg highway, the Camry delivers. The Camry is so middle-of-the-road that anyone even mildly interested in cars might find its lack of creativity off-putting. Interior ergonomics could use some improvement, as could technological integration. If it’s a compliant, nonintrusive ride you’re looking for – and if you’re shopping for a Camry, we’re guessing that’s the case – then the Camry delivers. On the road it’s as benign as can be, delivering minimal feedback and coasting over imperfections in the road with ease. But it’s not all smooth sailing (almost quite literally). 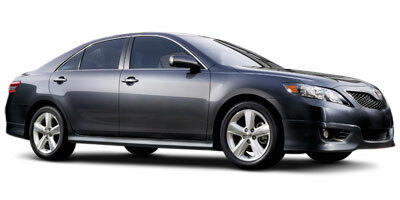 The throttle is pretty jumpy, and anything but a feather light tap of the gas pedal makes the Camry jump off the line. If you need to accelerate hard – say, to pass someone – and you leave your foot in it, the gearbox will bang out some very hard, mechanically unfriendly shifts. Couple this with steering that’s spongy and a brake pedal that grabs at the top of its travel then goes soft before the brakes grab again, and you’ve got a car that’s great for cruising but not so good when the pace picks up or panic stops become part of the game. The Camry SE is powered by a 2.5-liter inline four-cylinder engine that puts out 179 hp and 171 lb-ft of torque. A 268 hp V-6 engine is also available. Lower trim vehicles are fitted with a detuned version of the engine that puts out 10 less hp. Power is driven to the front wheels via either a six-speed manual transmission or, more commonly, a six-speed automatic transmission. All of the standard items you would expect from a mid-level trim are there, from a multi-information display to cruise control and keyless entry. Toyota offers a voice-activated navigation system for the Camry, but at over $3K it’s an expensive add-on. Homelink wireless garage opening, a power moonroof and a sliding sunshade can be added with the SE Extra Value Package, though it will require you to upgrade the stereo as well. 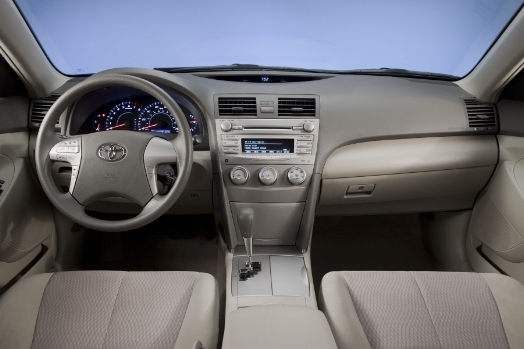 SE trim cars come with automatic headlamps, a three-spoke sport steering wheel, power driver’s seat and an AM/FM/MP3 radio with satellite radio capability. An optional JBL audio system with integrated Bluetooth for hands-free calling and wireless audio playback is also available. Toyota likes to flaunt their green credentials, and in this department the Camry SE does not disappoint, returning 22 mpg city, 32 mpg highway. If you do a lot of highway driving, you won’t be far off the hybrid model’s 34 mpg. The inside of the Camry is a comfortable enough place to be, with supportive seats and plenty of legroom for all four seats. The dash is a bit bland, however, and the center stack lacks style. It’s almost as if the interior were crafted by a political campaign manager – above all things it avoids taking a chance and offending someone. The SE comes standard with 17-inch alloy wheels and some bodywork and styling addenda that give it a bit of a personality, but overall the Camry remains a car that will blend into everyday traffic with ease. Then again, maybe that’s because there are so many of them on the road. 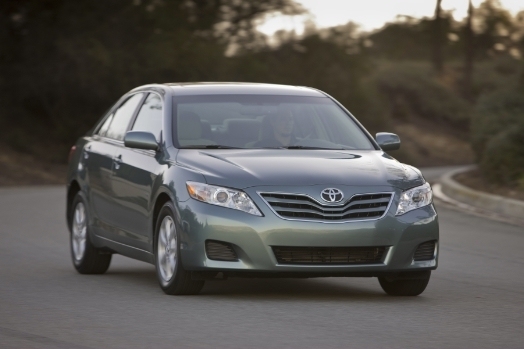 With an MSRP of $22,165, the Camry SE sits dead center in the midsize sedan marketplace. Even with options, most buyers will have trouble going north of $27K. The competition is tough, however, with excellent entries such as the Mazda 6 i Touring ($20,900), Hyundai Sonata SE ($22,250), Ford Fusion SE ($20,900), Nissan Altima 2.5 S ($21,840) and Subaru Legacy 2.5i Premium ($20,995) all putting up a strong fight against the Camry. The 2010 Camry SE is about as middle-of-the-road as you can get, and depending on what kind of car buyer you are, that will be either a very good or very bad thing. Certainly, it’s a lot of car for the money, but it lacks that special characteristic that makes you say, “wow, I love this car.â€ And for some, that’s what a new car is all about.